Arthur K. Wheelock Jr., “Meindert Hobbema/A View on a High Road/1665,” Dutch Paintings of the Seventeenth Century, NGA Online Editions, https://purl.org/nga/collection/artobject/69 (accessed April 24, 2019). In this work, the dirt road meanders diagonally through the village, passing half-timbered houses nestled among the trees. Figures strolling along the road or resting beside it are integrated harmoniously into this peaceful pastoral setting. Hobbema often had other artists paint staffage figures in his works. The elegantly dressed couple walking along the road was painted by one such unidentified collaborator. 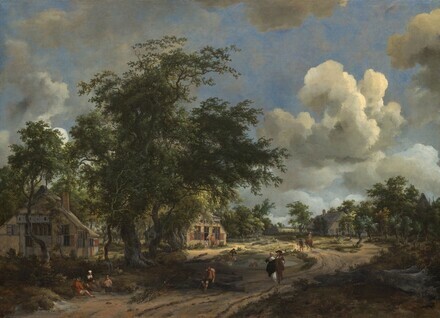 The idyllic qualities of Hobbema’s scenes, combined with the realistic effects of light and atmosphere, appealed tremendously to English collectors. In the nineteenth century, this painting along with its possible pendant (now in the Mauritshuis, The Hague), belonged to the collection of the Duke of Westminster. The date is now completely legible below the signature, but may not always have been so clear. Indeed, the first reference to the picture that describes it as being dated is National Gallery of Art, Summary Catalogue of European Paintings and Sculpture (Washington, DC, 1965), 68, although Wolfgang Stechow did challenge the statement in National Gallery of Art, Preliminary Catalogue of Paintings and Sculpture (Washington, DC, 1941), 97–98, that the picture was “painted probably in 1665,” saying “I thought I could read the date quite distinctly below the signature.” (Stechow letter, June 9, 1941, in NGA curatorial files.) The date appears to be old, but is painted in a different color from the signature. Its form does not conform with the inscription on the so-called pendant, which reads “M[e]yndert Hobbema.” Accounts of the signature itself are also inconsistent: Gustav Friedrich Waagen, Treasures of Art in Great Britain: Being an Account of the Chief Collection of Paintings, Drawings, Sculptures, and Illuminated Mss., 3 vols. (London 1854–1857), 2:166, the brochure produced c. 1940 by Duveen Brothers, and National Gallery of Art, Preliminary Catalogue of Paintings and Sculpture (Washington, DC, 1941) all state that, like the earlier A Wooded Landscape, A View on a High Road is signed “Meyndert Hobbema,” and Georges Broulhiet, Meindert Hobbema (1638–1709) (Paris, 1938), 401, and Cornelis Hofstede de Groot, Beschreibendes und kritisches Verzeichnis der Werke der hervorragendsten holländischen Maler des XVII. Jahrhunderts, 10 vols. (Esslingen and Paris, 1907–1928), 4:413, also say that it is “signed in full.” Today the lettering on the canvas clearly reads “m. hobbema,” a form of signature that the artist employed more frequently than his full name. It seems likely that all or part of the original signature and date were somehow damaged and subsequently reconstructed. Further changes may have occurred at a later date, perhaps as a result of restoration or cleaning. The road that passes through the rural village meanders diagonally into the distance, passing half-timbered houses that sit comfortably within the wooded landscape. The trees, which in earlier works form dense barriers in the middle distance (see A Wooded Landscape), rise only to the left of center. Otherwise, Hobbema has kept them low and relegated them to the peripheries of his scene. To judge from the patterns of light and shade, it seems to be midday. Villagers sit and relax beside the road or talk over the front stoop. Two children play with boats at a small pond beside the road, along which a mounted falconer and his attendant pass into the distance. In the center foreground an elegant couple, the man holding a stick, passes near a traveler with his knapsack resting on a cut log. Seymour Slive, Jacob van Ruisdael (The Hague, 1981), 79, no. 22. It is not known if Hobbema also made separate trips to this region, but buildings of this type first appear in his work around 1662 (as in The Travelers). Acc. no. R.F. 1526, 31 x 40 in. ; Cornelis Hofstede de Groot, Beschreibendes und kritisches Verzeichnis der Werke der hervorragendsten holländischen Maler des XVII. Jahrhunderts, 10 vols. (Esslingen and Paris, 1907–1928), 4:431, no. 173; Georges Broulhiet, Meindert Hobbema (1638–1709) (Paris, 1938), 192. 86.4 x 119.4 cm, John Smith, A Catalogue Raisonné of the Works of the Most Eminent Dutch, Flemish and French Painters, 9 vols. (London, 1829–1842), 6:134, no. 64; Cornelis Hofstede de Groot, Beschreibendes und kritisches Verzeichnis der Werke der hervorragendsten holländischen Maler des XVII. Jahrhunderts, 10 vols. (Esslingen and Paris, 1907–1928), 4:413, no. 120; Georges Broulhiet, Meindert Hobbema (1638–1709) (Paris, 1938), 188. The paintings hung as such in the Fizeau, Agar, and Grosvenor collections until the Washington painting was sold to Alfred Charles de Rothschild at the end of the nineteenth century. It is highly unlikely, however, that they were actually designed as pendants, for the compositions are parallel rather than complementary; the dimensions are also slightly different. The print was published by Boydell, London, February 20, 1786. Mme Jean Etienne Fizeau [née Marie Anne Massé, d. 1790], Amsterdam; (sale, Amsterdam, 27 April 1791); Welbore Ellis Agar [1735-1805], London; by inheritance to his illegitimate sons, Welbore Felix Agar [d. 1836] and Sir Emmanuel Felix Agar [1781-1866]; sold 1806 to Robert Grosvenor, 1st marquess of Westminster [1767-1845]; by inheritance to his grandson, Hugh Lupus Grosvenor, 1st duke of Westminster [1825-1899], Grosvenor House, London; purchased 1912 by Baron Alfred Charles de Rothschild [1842-1918], London and Halton House, near Wendover, Buckinghamshire; bequeathed to his illegitimate daughter, Almina Victoria, Countess of Carnarvon [c. 1877-1969, later Mrs. Ian Onslow Dennistoun], London; sold 1924 to (Duveen Brothers, Inc., London, New York, and Paris); sold November 1924 to Andrew W. Mellon, Pittsburgh and Washington, D.C.; deeded 28 December 1934 to The A.W. Mellon Educational and Charitable Trust, Pittsburgh; gift 1937 to NGA. The Fizeau (variously spelled Fiseau, Fezeau, or Fiziau) sale was known to Frits Lugt not from an actual example of the catalogue, but because it is listed in Adriaan van der Willigen, Naamlijst van Nederlandsche kunst catalogi veelal met derzelver prijzen en namen, van af 1731-1861, welke de verzameling uitmakern van A. van der Willigen, Haarlem, 1873. The Ellis Agar Collection was to be sold at Christie's, London, 2-3 May 1806, and a sale catalogue was produced, but before the auction could take place the complete collection was instead sold to Lord Grosvenor, for 30,000 guineas (George Redford, Art Sales, 1628-1887, 2 vols., London, 1888: 1:95). The bill of sale is preserved at the Grosvenor Estate Office Archive; the Hobbema is number 42 on this list (information kindly provided by Michael Hall, curator to Edmund de Rothschild, letter of 5 March 2002, in NGA curatorial files). The date of Alfred's acquisition of the picture was kindly provided by Michael Hall, curator to Edmund de Rothschild; see his "Rothschild Picture Provenances" from 1999 and his letter of 27 February 2002, in NGA curatorial files, in which he cites relevant documents in The Rothschild Archive, London. Duveen Brothers Records, accession number 960015, Research Library, Getty Research Institute, Los Angeles: reel 292, box 437, folders 4 and 5; copies in NGA curatorial files. British Institution for Promoting the Fine Arts in the United Kingdom, London, 1834, either no. 136 or no. 139. British Institution for Promoting the Fine Arts in the United Kingdom, London, 1845, either no. 49 or no. 52. Works of Old Masters, Burlington Fine Arts Club, London, 1871, either no. 35 or no. 41. A Loan Exhibition of Dutch Paintings, Detroit Institute of Arts, 1925, no. 11. Paintings by Old Masters from Pittsburgh Collections, Carnegie Institute, Pittsburgh, 1925, no. 28. Exhibition records for the two paintings are confusing, as two Hobbemas from the Grosvenor collection were lent to exhibitions in London in 1834, 1845, and 1871 (see Algernon Graves, A Century of Loan Exhibitions, 1813–1912, 5 vols. [London, 1913–1915], 3:514, 515, 517). In each of the exhibition catalogues the paintings are given nearly identical titles, and there are no descriptions provided. Frank Cundall, The Landscape and Pastoral Painters of Holland: Ruisdael, Hobbema, Cuijp, Potter (London, 1891), 158, mentions the 1845 and 1871 exhibitions under his listing for A View on a High Road and its pendant. Cornelis Hofstede de Groot, A Catalogue Raisonné of the Works of the Most Eminent Dutch Painters of the Seventeenth Century, trans. Edward G. Hawke, 8 vols. (London, 1907–1927), does not mention these exhibitions under either picture. The support, a fine-weight, plain-weave fabric, has been lined with the top tacking margin trimmed. At some point or points during the painting’s history, the painted canvas along the top edge was twice folded over the stretcher to serve as a tacking margin. This edge was then later restored to the picture plane, while the original tacking margins on the bottom, left, and right sides were unfolded and added to the picture plane. The present dimensions are thus slightly expanded at the bottom and sides. A thin, reddish ground layer is covered by a pale brown imprimatura, which has been incorporated as a mid-tone in the sky and foreground. On top of this base, the design was sketched in thin dark paint, which was allowed to remain visible in the shadows. Then the paint was built up in thin pastes. The sky was painted first with reserves left for the houses and trees. The landscape was completed before the foreground figures were added. The gabled house at far right was made smaller, and the tree to the right of the pathway was shifted slightly. Thin bands of loss occur along fold lines and around tacking holes. The paint is rather abraded in the sky. In 1995 the painting was treated to remove discolored varnish and inpainting. At that time the sky was rather extensively inpainted to cover the abrasion. Young, John. A Catalogue of the Pictures at Grosvenor House, London. London, 1820: 37, no. 109, etched repro. Smith, John. A Catalogue Raisonné of the Works of the Most Eminent Dutch, Flemish and French Painters. 9 vols. London, 1829-1842: 6(1835):134–135, no. 65. British Institution for Promoting the Fine Arts in the United Kingdom. British Institution for Promoting the Fine Arts in the United Kingdom. Exh. cat. British Institution, London, 1834: either no. 136 or no. 139. Young, John. Catalogue of the Marquess of Westminster's collection of pictures in Grosvenor House. London, 1840: 37, no. 109, etched repro. Jameson, Anna Brownell Murphy. Companion to the Most Celebrated Private Galleries of Art in London. London, 1844: 266, no. 99. British Institution for Promoting the Fine Arts in the United Kingdom. Catalogue of pictures by Italian, Spanish, Flemish, Dutch, French, and English masters: with which the proprietors have favoured the institution. Exh. cat. British Institution, London, 1845: either no. 49 or no. 52. Jervis-White-Jervis, Lady Marian. Painting and Celebrated Painters, Ancient and Modern. 2 vols. London, 1854: 2:225, 344. Waagen, Gustav Friedrich. Treasures of Art in Great Britain: Being an Account of the Chief Collections of Paintings, Drawings, Sculptures, Illuminated Mss.. 3 vols. Translated by Elizabeth Rigby Eastlake. London, 1854: 2:166. Thoré, Théophile E. J. (William Bürger). "Hobbema." Gazette des Beaux-Arts 4 (October 1859): 33. Blanc, Charles. "Isaac Ostade" (vol. 1) and "Minderhout Hobbema" (vol. 2). In École hollandaise. 2 vols. Histoire des peintres de toutes les écoles 1-2. Paris, 1861: 1:10; 2:12 (each artist's essay paginated separately). Burlington Fine Arts Club. Exhibition of the works of Old Masters. Exh. cat. Burlington Fine Arts Club, London, 1871: either no. 35 or no. 41. Michel, Émile. Hobbema et les paysagistes de son temps en Hollande. Les Artistes Célèbres. Paris, 1890: 19, 50. Cundall, Frank. The Landscape and Pastoral Painters of Holland: Ruisdael, Hobbema, Cuijp, Potter. Illustrated biographies of the great artists. London, 1891: 58, 158. Wurzbach, Alfred von. Niederlandisches Kunstler-Lexikon. 3 vols. Vienna, 1906-1911: 1(1906):691. Hofstede de Groot, Cornelis. A Catalogue Raisonné of the Works of the Most Eminent Dutch Painters of the Seventeenth Century. 8 vols. Translated by Edward G. Hawke. London, 1907-1927: 4(1912):394-395, no. 121. Graves, Algernon. A Century of Loan Exhibitions, 1813–1912. 5 vols. London, 1913-1915: 2(1913):515 or 517, nos. 49, 52, or 35. Carnegie Institute. An Exhibition of Paintings by Old Masters from the Pittsburgh Collections. Exh. cat. Carnegie Institute, Pittsburgh, 1925: no. 28. Valentiner, Wilhelm R. Loan Exhibition of Dutch Paintings of the Seventeenth Century. Exh. cat. Detroit Institute of Arts. Detroit, 1925: no. 11. Rosenberg, Jakob. "Meindert Hobbema: Country Road with Houses and Trees on Either Side." In Unknown Masterpieces in Public and Private Collections. Edited by Wilhelm R. Valentiner. London, 1930: no. 59, repro. Rosenberg, Jakob. "Meindert Hobbema: Country Road with Houses and Trees on Either Side." In Unknown Masterpieces in Public and Private Collections. Wilhelm R. Valentiner, ed. London, 1930: n.p., pl. 59. Frankfurter, Alfred M. "Masterpieces of Landscape Painting in American Collections." The Fine Arts 18, no. 1 (December 1931): 27, repro. Döhmann, Karl, and W. H. Dingeldein. Singraven: de Geschiedenis van een Twentsche Havezate. 4 vols. Brussels, 1934: 3:144-145. Tietze, Hans. Meisterwerke europäischer Malerei in Amerika. Vienna, 1935: 338, no. 194, repro. Broulhiet, Georges. Meindert Hobbema (1638–1709). Paris, 1938: 59, 196, 401, no. 189, repro. Tietze, Hans. Masterpieces of European Painting in America. New York, 1939: 322, no. 194, repro. Preliminary Catalogue of Paintings and Sculpture. National Gallery of Art, Washington, 1941: 97-98, no. 62. Book of Illustrations. National Gallery of Art, Washington, 1942: 240, repro. 27. National Gallery of Art. Paintings and Sculpture from the Mellon Collection. Washington, 1949 (reprinted 1953 and 1958): 99, repro. Baird, Thomas P. Dutch Painting in the National Gallery of Art. Ten Schools of Painting in the National Gallery of Art 7. Washington, 1960: 22, color repro. National Gallery of Art. Summary Catalogue of European Paintings and Sculpture. Washington, 1965: 68. Stechow, Wolfgang. Dutch Landscape Painting of the Seventeenth Century. Kress Foundation Studies in the History of European Art 1. London, 1966: 78. Frick Collection. The Frick Collection: An Illustrated Catalogue. 2 vols. Vol. 1, Paintings: American, British, Dutch, Flemish and German. New York, 1968: 1:224. National Gallery of Art. European Paintings and Sculpture, Illustrations. Washington, 1968: 59, repro. Fitzwilliam Museum. Landscapes from the Fitzwilliam. Exh. cat. Hazlitt Gooden & Fox, London. Cambridge, 1974: 32. National Gallery of Art. European paintings: An Illustrated Summary Catalogue. Washington, 1975:174, repro. Walker, John. National Gallery of Art, Washington. New York, 1975: 295, no. 398, color repro. Watson, Ross. The National Gallery of Art, Washington. New York, 1979: 77, pl. 65. Robertson, Alexander, and Christopher Wright. Dutch Seventeenth Century Paintings from Yorkshire Public Collections. Exh. cat. Leeds City Art Gallery. Leeds, 1982: 16. Hanhisalo, Judith Evans. Enjoying art: painting, sculpture, architecture, and the decorative arts. Englewood Cliffs, New Jersey, 1983: 156-157, fig. 111. Walker, John. National Gallery of Art, Washington. Rev. ed. New York, 1984: 295, no. 391, color repro. Wheelock, Arthur K., Jr. Dutch Painting in the National Gallery of Art. Washington, D.C., 1984: 38-39, color repro. National Gallery of Art. European Paintings: An Illustrated Catalogue. Washington, 1985: 202, repro. Sutton, Peter C. Masters of 17th-century Dutch landscape painting. Exh. cat. Rijksmuseum, Amsterdam; Museum of Fine Arts, Boston; Philadelphia Museum of Art. Boston, 1987: 347. National Gallery of Art. National Gallery of Art, Washington. New York, 1992: 138, repro. Minor, Vernon Hyde. Art history's History. Englewood Cliffs, New Jersey, 1994: 118, fig. 20. Keyes, George S. "Meindert Hobbema's Wooded Landscape with a Water Mill." The Minneapolis Institute of Arts Bulletin 67 (1995): 48, fig. 7. Ploeg, Peter van den. Meindert Hobbema: Wooded landscape with cottages - A major acquisition for the Netherlands. The Hague, 1995: unpaginated brochure, fig. 6. Wheelock, Arthur K., Jr. Dutch Paintings of the Seventeenth Century. The Collections of the National Gallery of Art Systematic Catalogue. Washington, 1995: 123-127, color repro. 125. Waagen, Gustav Friedrich. Treasures of Art in Great Britain. Translated by Elizabeth Rigby Eastlake. Facsimile edition of London 1854. London, 2003: 2:166. Wiemann, Elsbeth, Jenny Gaschke, and Mona Stocker. Die Entdeckung der Landschaft: Meisterwerde der niederländischen Kunst des 16. und 17. Jahrhunderts. Exh. cat. Staatsgalerie Stuttgart. Cologne, 2005: 109, no. 37, repro. The date is now completely legible below the signature, but may not always have been so clear. Indeed, the first reference to the picture that describes it as being dated is National Gallery of Art, Summary Catalogue of European Paintings and Sculpture (Washington, DC, 1965), 68, although Wolfgang Stechow did challenge the statement in National Gallery of Art, Preliminary Catalogue of Paintings and Sculpture (Washington, DC, 1941), 97–98, that the picture was “painted probably in 1665,” saying “I thought I could read the date quite distinctly below the signature.” (Stechow letter, June 9, 1941, in NGA curatorial files.) The date appears to be old, but is painted in a different color from the signature. Its form does not conform with the inscription on the so-called pendant, which reads “M[e]yndert Hobbema.” Accounts of the signature itself are also inconsistent: Gustav Friedrich Waagen, Treasures of Art in Great Britain: Being an Account of the Chief Collection of Paintings, Drawings, Sculptures, and Illuminated Mss., 3 vols. (London 1854–1857), 2:166, the brochure produced c. 1940 by Duveen Brothers, and National Gallery of Art, Preliminary Catalogue of Paintings and Sculpture (Washington, DC, 1941) all state that, like the earlier A Wooded Landscape, A View on a High Road is signed “Meyndert Hobbema,” and Georges Broulhiet, Meindert Hobbema (1638–1709) (Paris, 1938), 401, and Cornelis Hofstede de Groot, Beschreibendes und kritisches Verzeichnis der Werke der hervorragendsten holländischen Maler des XVII. Jahrhunderts, 10 vols. (Esslingen and Paris, 1907–1928), 4:413, also say that it is “signed in full.” Today the lettering on the canvas clearly reads “m. hobbema,” a form of signature that the artist employed more frequently than his full name. It seems likely that all or part of the original signature and date were somehow damaged and subsequently reconstructed. Further changes may have occurred at a later date, perhaps as a result of restoration or cleaning. See Josef Schepers, Haus und Hof westfälischer Bauern (Münster, 1960). Karl Döhmann and W. H. Dingeldein, Singraven: De Geschiedenis van een Twentsche Havezate, 4 vols. (Brussels, 1934), 3:144–145. The paintings are in the Musée du Louvre, Paris (no. M.I. 270; Cornelis Hofstede de Groot, Beschreibendes und kritisches Verzeichnis der Werke der hervorragendsten holländischen Maler des XVII. Jahrhunderts, 10 vols. [Esslingen and Paris, 1907–1928], 4:401–402, no. 89; Georges Broulhiet, Meindert Hobbema [1638–1709] [Paris, 1938], 441; cf. fig. 1 under A Farm in the Sunlight), and the National Gallery, London (no. 832; Cornelis Hofstede de Groot, Beschreibendes und kritisches Verzeichnis der Werke der hervorragendsten holländischen Maler des XVII. Jahrhunderts, 10 vols. [Esslingen and Paris, 1907–1928], 4:397, no. 76; Georges Broulhiet, Meindert Hobbema [1638–1709] [Paris, 1938], 220). For the relationship between the buildings painted by Hobbema and the Singraven location, see Ben P. J. Broos, Great Dutch Paintings from America (The Hague, 1991), 285–290, no. 32. Seymour Slive, Jacob van Ruisdael (The Hague, 1981), 79, no. 22. 86.4 x 119.4 cm, John Smith, A Catalogue Raisonné of the Works of the Most Eminent Dutch, Flemish and French Painters, 9 vols. (London, 1829–1842), 6:134, no. 64; Cornelis Hofstede de Groot, Beschreibendes und kritisches Verzeichnis der Werke der hervorragendsten holländischen Maler des XVII. Jahrhunderts, 10 vols. (Esslingen and Paris, 1907–1928), 4:413, no. 120; Georges Broulhiet, Meindert Hobbema (1638–1709) (Paris, 1938), 188. John Young, A Catalogue of the Pictures at Grosvenor House, London (London, 1820), 37, says that the figures were painted by Adriaen van de Velde (Dutch, 1636 - 1672). Several other nineteenth-century writers (John Smith, A Catalogue Raisonné of the Works of the Most Eminent Dutch, Flemish and French Painters, 9 vols. [London, 1829–1842], 4:134–135; Gustav Friedrich Waagen, Treasures of Art in Great Britain: Being an Account of the Chief Collection of Paintings, Drawings, Sculptures, and Illuminated Mss., 3 vols. [London 1854–1857], 2:166; Émile Michel, Hobbema et les paysagistes de son temps en Hollande [Paris, 1890], 50) attribute them to Lingelbach. Ben P. J. Broos has proposed that the elegant figures were added in the eighteenth century, during a period when artists “finished” a number of seventeenth-century landscape drawings by adding figures to their foregrounds. See Ben P. J. Broos, “Improving and Finishing Old Master Drawings: An Art Itself,” Hoogsteder-Naumann Mercury 8 (1989): 34–55. This hypothesis is, however, unlikely since the peasant seated on a log is looking at the couple.